Halloween is such a fun, creative holiday. I look forward to October so that I can find new ways to make food whimsical and wacky. 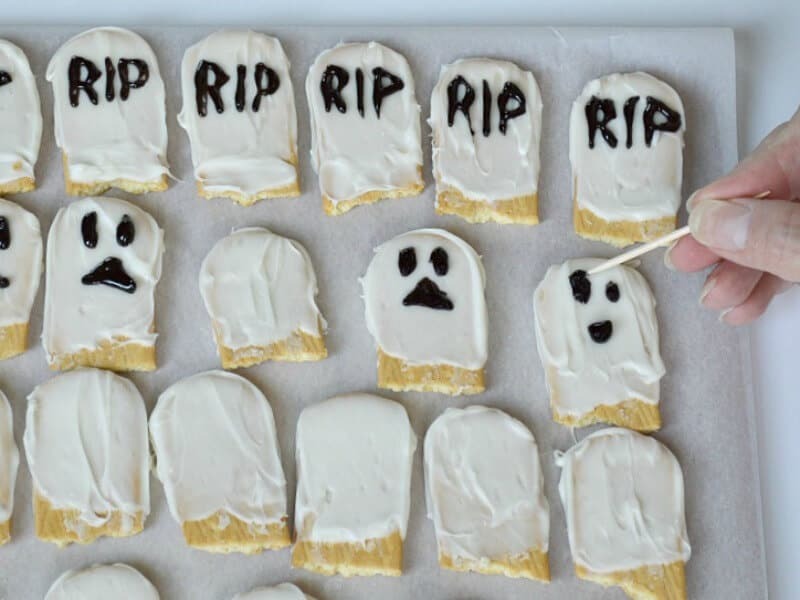 When else can you make a cookie look like a tombstone and have people be excited about it? 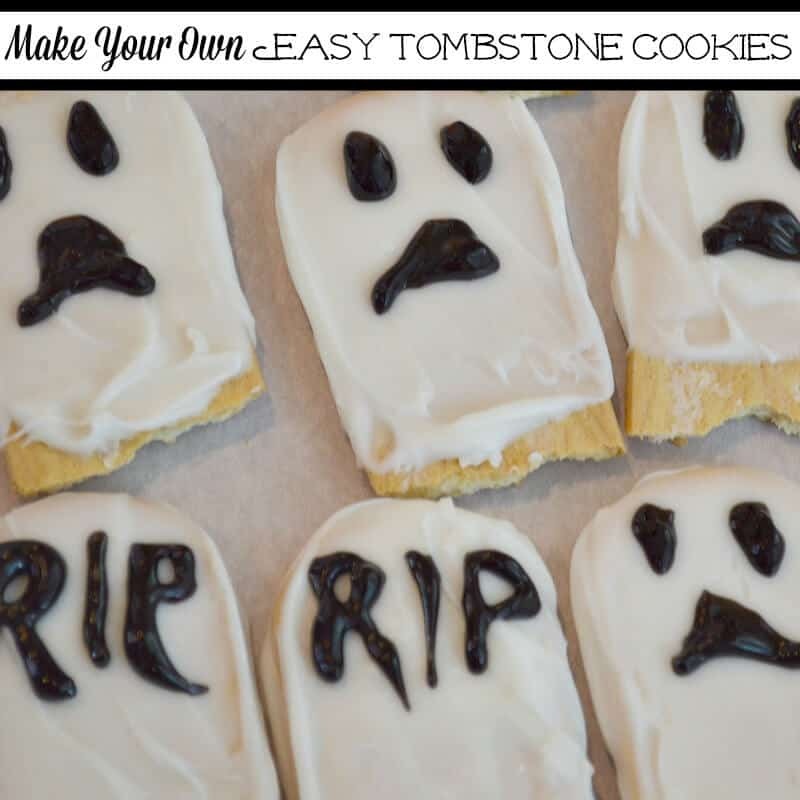 Making these easy tombstone cookies is simple enough that you could make them with the kiddos and cool enough to wow them. Making your own tombstone cookies allows you to personalize the writing with whatever message or image you’d like. I relish the opportunity to create my own Halloween treat decorations. It gives me an occasion to be creative and I enjoy showing my love and affection through making special treats. It also gives me the opportunity to personalize the decorations in any way I like. 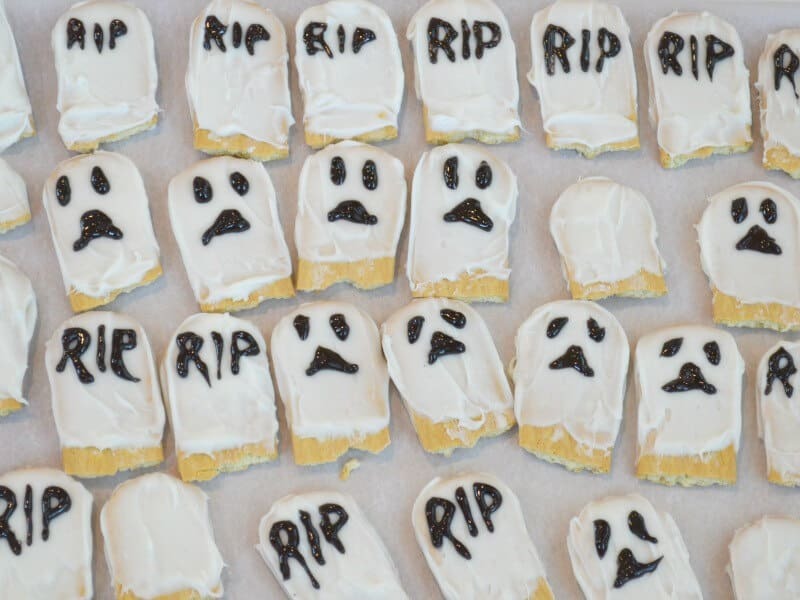 I created these tombstone cookies for a graveyard treat so I decorated them with “RIP” and ghost faces. It would be easy to add any decoration you’d like to the tombstone face. The only limitation is your imagination (and a steady decorating hand). I purchased tombstone-shaped sandwich cookies, so I separated the cookies and removed the icing filling. I trimmed the end off the cookies to give them a more tombstone-ish shape. Melt the candy coating according to the directions on the package. I used a knife to spread the candy coating onto the cookies. Don’t worry if the candy coating doesn’t cover the cookie perfectly, it is a pretend creepy tombstone after all. I added the decorations to the cookies with the tube of icing. Then I used my favorite decorating tool – a toothpick – to finalize the decoration. Don’t stress over creating perfect images. Keep reminding yourself that you are making fun decorations and the imperfections add to the whimsy. 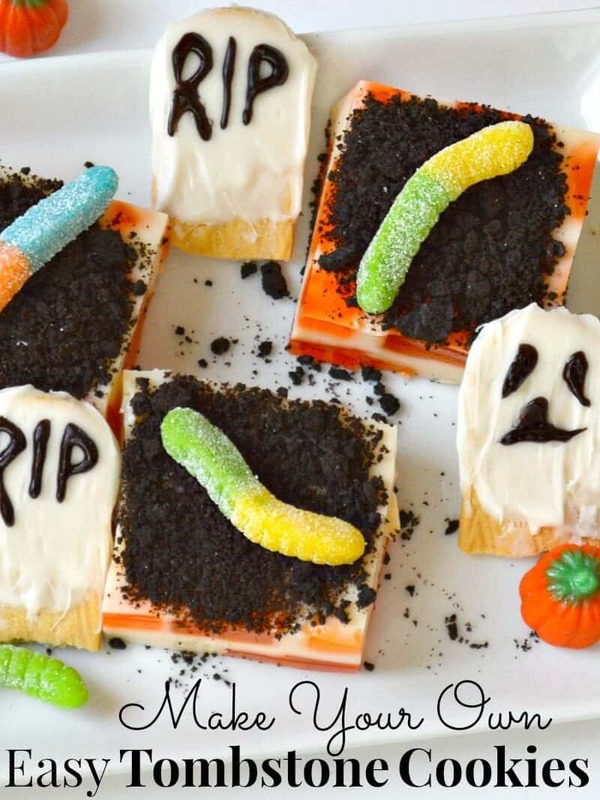 These easy tombstone cookies are perfect for decorating cakes, cupcakes and other Halloween treats. Of course, they’re delicious and a fun treat all on their own as decorated cookies. Those Halloween ghost cookies are so clever. I like that they’re simple enough for the kids to help make them. Thanks, Janis, they were fun to make (and to eat 🙂 ). These are great! I am so excited for Halloween. You have the best ideas to make if the best holiday. Thanks, Monica. My family has fun with Halloween and they’ve inspired me. 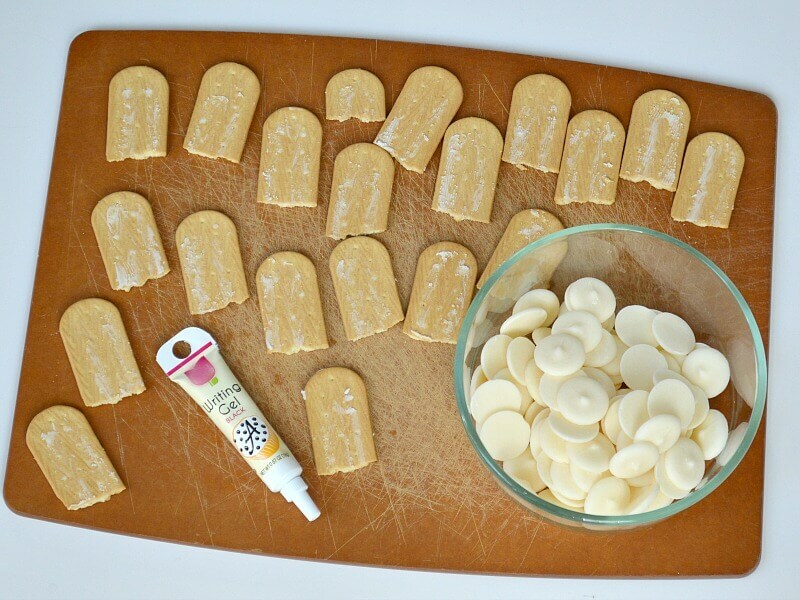 We have fun Halloween traditions that center around baking and decorating! This looks like a fun addition to our list. Thanks. Those little tombstones are so cute! The ghosts are the cutest. I will have to remember this idea for next year. I know they would taste great – I love anything dipped in white chocolate.